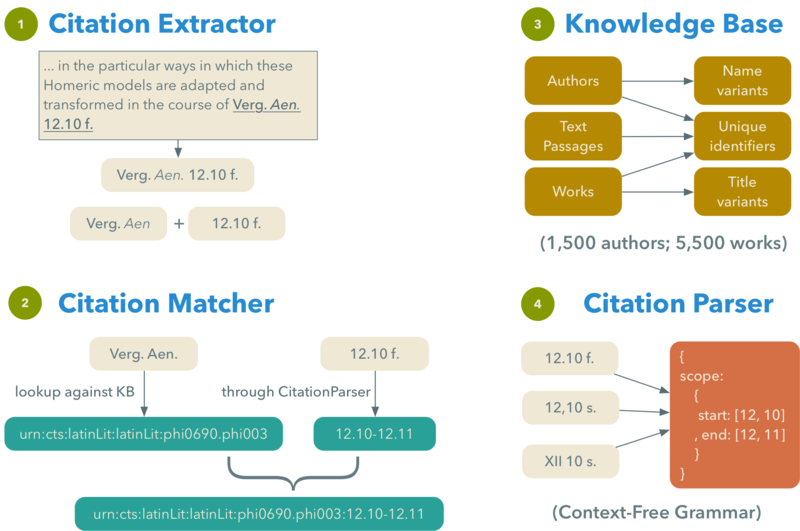 Cited Loci | Citation mining for Classics publications at scale. Citation mining for Classics publications at scale. The Cited Loci project aims at extracting all bibliographic references pointing to classical (Greek and Latin) authors and their texts from the classics articles contained in JSTOR. the Citation Parser, which takes care of transforming reference scopes into a normalized form, suitable to be embedded into a CTS URN. Cited Loci of the Aeneid is a proof of concept of how next-generation tools for retrieving bibliographic information could look like. More than five thousands articles that quote or refer to specific passages of Virgil’s Aeneid are made searchable trough an intuitive interface. To build this, more than 12,000 canonical references to the Aeneid were extracted from over 5,700 journal articles in JSTOR using Cited Loci’s technology. Read more about this collaboration in this blog post. Cited Loci’s citation mining technology is currently being employed, in a collaboration with the Epische Bauformen project at the University of Rostock, to support the creation of an index of cited passages (index locorum) for the compendium Structures of Epic Poetry. This publication in three volumes is edited by Prof. Christiane Reitz and Dr. Simone Finkmann, and will be published by De Gruyter. Thanks to a collaboration with Leonard Muellner at Harvard’s Center for Hellenic Studies (CHS), summer interns have been working to train Cited Loci’s citation mining tools to index canonical references from the Open Access books and monographs published by CHS. Romanello, M. 2019 (forthcoming). “Large-Scale Extraction of Canonical References: Challenges and Prospects.” In Pierazzo, E. and Cogitore, I. eds., Digital Humanities and Antiquity. Humanités Numériques et Antiquité. Actes Du Colloque International, Grenoble 2-4 Septembre 2015, 74–89 (preprint). Romanello, M. 2015. “From Index Locorum to Citation Network: An Approach to the Automatic Extraction of Canonical References and Its Applications to the Study of Classical Texts.” King’s College London. doi:11858/00-1780-0000-002A-4537-A.